While the Northern hemisphere waves goodbye to another summer… I’m waaaay down in the Southern hemisphere in Australia, waiting for mine to arrive. I confess I am rather spoilt… we took these photos mid-August on a quiet local beach while walking the dog and I wasn’t cold, it was a beautiful day. Spring is nearly here & a sundress is an eminently sensible way to celebrate! New Look 6048 – my Hello & Goodbye Summer Dress. Grinning like a goose as the waves catch me unawares! Once I spotted this beautiful black & white lightweight stretch cotton on the Mood Fabrics website I was head over heels in love. 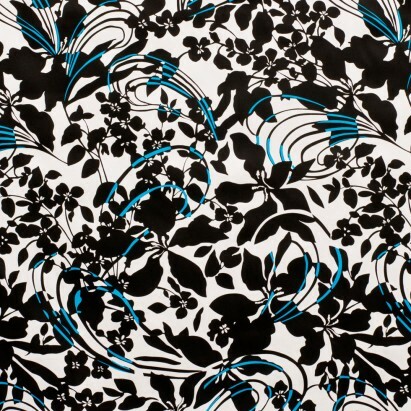 I love a classic black/white print, however it’s the pop of aqua that makes this fabric gorgeous. Mood was most helpful in pairing it with a beautiful contrast cotton sateen for me, this one is Hawaiian Ocean Blue Stretch Cotton Sateen. I love this combination it is light, bright and summery. I also have a particular fondness for cotton sateens. They are marvellously easy to sew with and endlessly versatile, perfect for dresses, trousers, jackets and more. Not to mention coming in a wide variety of gorgeous colours and prints! This fabric is lovely quality and a generous 58 inches wide, giving you lots of room to play – perfect for very wide skirts or circle skirts. It has a touch of lycra which adds a bit of crosswise stretch to the fabric – hello comfortable sundress! I had planned to make a Vogue Vintage frock… however I kept coming back to New Look 6644 and in the end I gave into my instincts. The pattern itself is easy to sew, which isn’t why I chose it, I simply love a sweetheart neckline! I decided to fully line this dress with some cotton lawn from my stash, Mood has a similar fabric here. I always have several metres stashed as it seems to be useful for all manner of projects. Lining a dress might seem onerous or double the sewing time, I find lined dresses last longer, wear better and crease less. I also often make the lining to test the fit. It’s an excellent timesaver because if it does indeed fit… you are half way there! New Look 6048 – fully lined. I like my lining to be several centimetres shorter than my shell, I’m not one for peekaboo hemlines. If you are considering lining this particular dress, when you line the bodice you just need to layer the shell and lining wrong sides together. The top contrast band is then attached to both fabrics along the neckline on the wrong side then turned over to the front of the dress and slip-stitched down. It’s a very simple and neat finish. I also decided to give the dress a little more structure by adding some lightweight boning to the lining seams. Mood Fabrics has some fabric covered boning here, as it is a sundress I don’t think you want very rigid or structured boning. I love how the dress sits with a some added soft structure and shape. I opted to use a white invisible zipper for this dress. I did worry for a little while about the white zipper tab showing at the top of the dress… however I actually really like the white contrast against the aqua and decided to leave it white rather than painting it with nail polish to conceal it. Cotton sateen and stretch cotton are just lovely to sew with. They have a little more weight than a basic poplin and are far more forgiving to sew. Not to mention the slightly lovely sheen that the fabrics possess, giving a humble sundress a little more wow. I would advise not ignoring those pattern instructions advising you to staystitch your edges, the lycra stretch does need to be contained as you don’t want a gaping neckline! I think this pattern is particularly suited to cotton sateen as the neckline is staystitched, stitched and then understitched… AND the contrast band is interfaced, making it far less likely to stretch out. Now I’m off to sit out the final days of my winter… and embrace some welcome warmth and sunshine. I am one of those people guilty of clinging to their summer dresses as autumn approaches and wearing them in the fading days of winter, teamed with cardigans and jackets in a desperate bid to pretend the colder days will soon be gone…. I’m not the only one that does that… am I?